There will be three lenses available: Wide Angle, Telephoto, and a “Zoom” Macro Lens. ExoLens states that they’ll be available first for the iPhone 6/6s and 6 Plus/6s Plus, but other versions may follow. So let’s take a more detailed look at the specifications for these three lenses. The new wide angle lens offers 0.6x magnification, which yields similar results to an 18mm lens on a DSLR.  The lens is capable of focusing from a distance of 50cm to infinity, which is more than enough range for most wide angle uses. The telephoto lens offers a 2x magnification with a 36mm minimum focus distance (relatively standard for iPhone add-on lenses), which is similar to a 58mm DSLR lens. 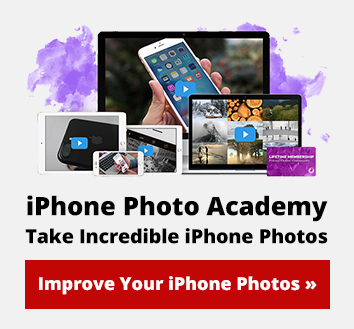 While this would be considered more of a “normal” lens on a larger camera, keep in mind that the built-in lens of the iPhone is actually considered to be a wide angle lens to begin with. While it doesn’t appear to be a zoom lens in the traditional sense, it appears that it allows for a greater focal range compared to other macro lenses which typically only focus at a very specific length while all else remains out-of-focus. Like all macro lenses, this new lens allows you to focus at extremely close distances, but with a bit more range than most macro lenses. This could potentially make for a more forgiving shooting experience. Many folks use an iPhone tripod, together with an iPhone tripod mount, for macro photography. The shallow focal distance makes it very hard to create decent hand-held macro shots. 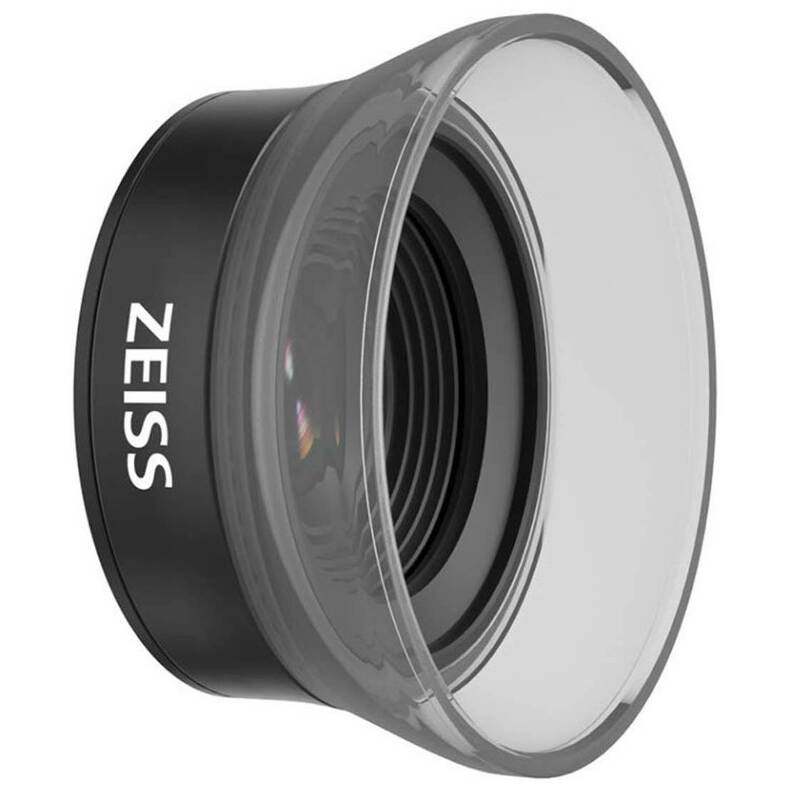 This new macro lens from ExoLens and Zeiss may remedy that issue. The magnification of the macro lens is such that an object as small as 3cm could fill the frame for incredible close-up (macro) photography. The lens also comes with a semi-transparent lens hood/diffuser. This allows you to get extremely close to your subject while still allowing in additional light from the sides to help improve exposure. It also serves as a handy guide for knowing how close you can get to your subject (the depth of the hood itself). All three of these new lenses are characterized by the manufacturer as typical of the Zeiss quality and styling. From the black anodized aluminum frames to the T*® anti-reflective coatings that minimize glare, these lenses appear to be of the highest design quality. They could potentially give other premium add-on lenses such as those from Moment Lenses a run for their money. All three of the lenses are said to offer edge-to-edge sharpness with minimal distortion and no noticeable chromatic aberration (blurring and/or colored “fringing”). This isn’t surprising coming from such a notable optics manufacturer as Zeiss. To expect anything less than near-perfect optics from Zeiss would be unusual. At the same time, this puts a great deal of pressure on both Zeiss and ExoLens to deliver on this quality when the lenses are released later this year. The lenses attach to your iPhone via a unique ExoLens mounting bracket. The bracket is made from machined aluminum, and each lens mounts to the bracket using a secure screw thread. 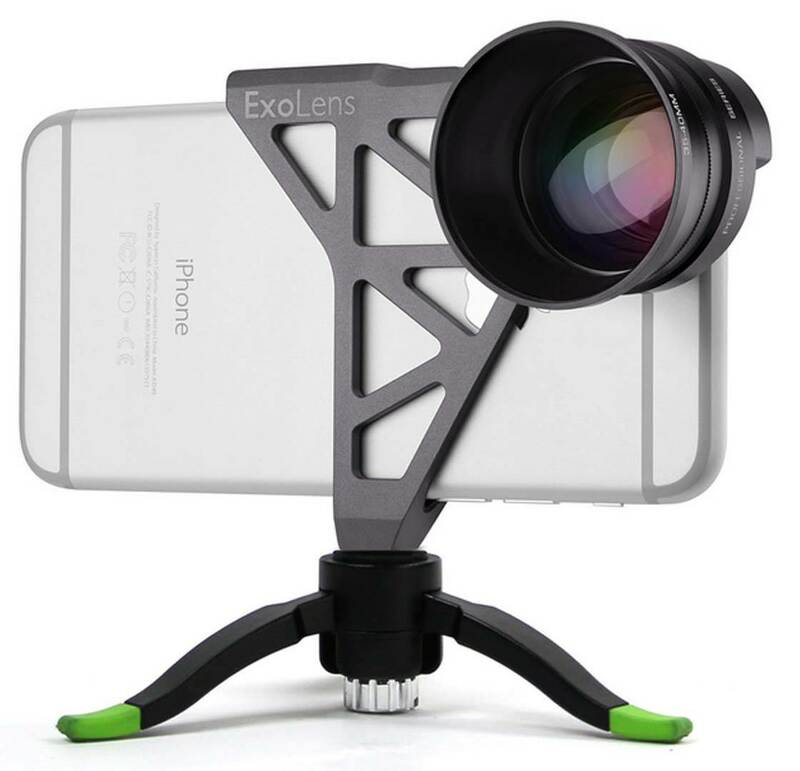 The ExoLens bracket doesn’t serve as a full case for your iPhone, unlike many other add-on lens mounts. Therefore, in order to use the lenses, you can’t use a case at the same time. The ExoLens frame also includes a standard-sized threaded tripod mount and an accessory shoe for mounting external lights and other accessories. 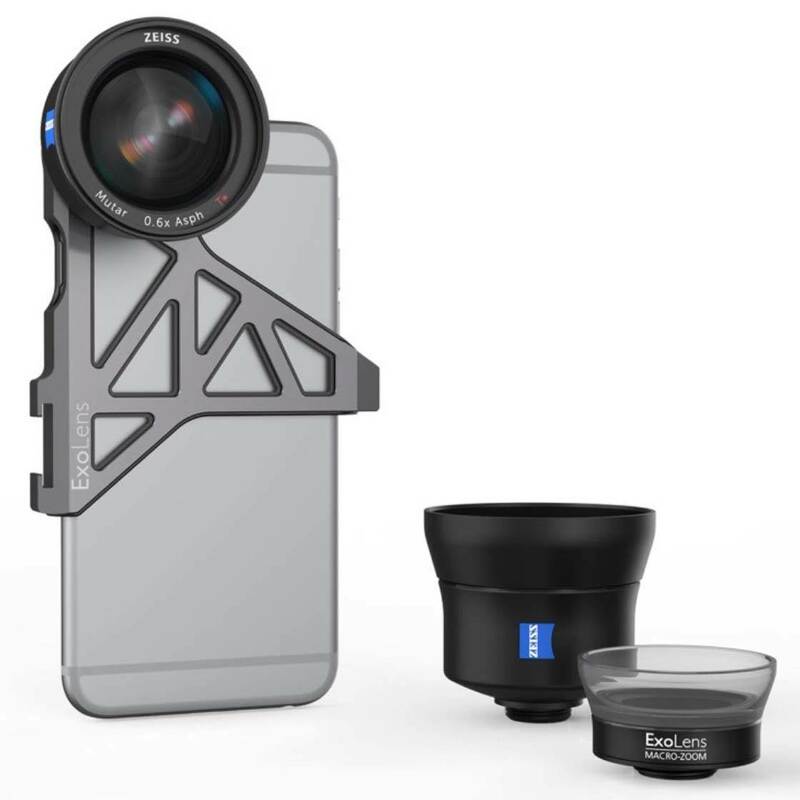 The ability to add a Zeiss-quality lens (or lenses) to your iPhone could result in a huge step forward when it comes to using external lenses in your photography. While we haven’t been able to test these new lenses yet (they’re due to be released some time before mid-2016), they look extremely promising and may very well become the best premium add-on lenses for the iPhone. For more information, and to sign up for notifications as to when these new lenses will be released, please visit the ExoLens website.